New ListingAudio Research SP-3A-1 Stereo Tube Preamp with phono Black and Gold! Beautiful! Audio Research SP-3A-1 Stereo Tube Preamp with phono Gold and Black! Preamp is very holographic and musical timber is stunning. This preamp trounces a lot of the newer stuff. Sound is very robust, especially the bottom end. The unit is in good physical condition with scuffs, scratches and minor nicks on edge from normal use. This is a working quiet unit. Tested on AUX, TUNER, TAPE 1 / 2. To bring out the best of this USA made Marantz the unit should be service. New ListingHafler DH-110 Preamplifier. Vintage Preamp. Note: Case pictured is actual item and the C-1 Preamp pictured is. This is a unique preamp that I built a few years back. It is a Bottlehead Foreplay 2 built in a blank Dynaco 70 chassis. I used upgraded parts including close matched resistors, Ultra Fast diodes, premium capacitors, and wired it with silver coated copper, Teflon wire. Plays like a dream! In good overall condition, plastic button cover for Tape 2 button is missing. Rubber feet are not included, this was originally in a wood case. Any accessories, cables, or parts, if included, will be shown. Legendary Apt Holman Preamp. Hand-made in Boston, Massachusetts, USA. Two unswitched and three switched outlets, rated 1kilowatt maximum. 10 foot unpolarized power cord, but oddly the accessory outlets are polarized. The unit is in good physical condition with 3 missing knob covers #1 #2 and #3. #1 the top of the tip is broken. All 3 switches work properly. Sold AS IS for restoration. I have changed my mind. This amplifier, successor to the renowned DH-200 introduced in 1979, owes its outstanding performance to its unusual design (by David Hafler) and impressive audio specs The amplifier itself is protected by five fuses, one protecting the main AC power line and two protecting each of the amplifier boards. Original manual and brochure for 610. Local pick and inspection is free and CASH only when you do pick up. I am currently using this wonderful pre-amp to feed a number of devices into my sonos system. Everything sounds good through this preamp. The whole is greater than the parts. A copy of the Sumo Electra manual available upon request. If you want both, buy it now is your best move if your wish is to ensure you don't get one without the other. Owl 1 Restoration Module 78 rpm MONO LP Historic EQUALIZER PREAMP Vertical. Works great. Perfect for 78rpm playback. Power supply included. I may have the instruction manual somewhere and will include it if I can find it. This is a fantastic piece of equipment. Shipped with USPS. International buyers welcome. You pay actual shipping cost. Monarchy Audio Model 33 Class A Preamplifier. Shipped with UPS Ground. 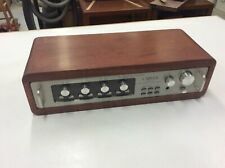 New ListingApt Holman one 1 Vintage Stereo Preamp phono/tape loops/box/manual $650 list ! Weight: 4.8kg. Output: 2V (Pre out), 7V (Pre out Max). Signal to noise ratio: 78dB (MM), 106dB (line). Crown IC150 solid-state hi-fi preamplifier. I am sure you know how good this particular preamp is. They certainly do not make quality gear like this anymore. This particular example is not like any other Yamaha C-2X that you will ever find for multiple reasons . This unit is black and about as new as you can get. The date of manufacture is December of 2018. As such, the 2 year warranty started in January 2019. The tubes in this unit have way less than 100 hours on them (probably less than 20 given my schedule). PIONEER SPEC-1 VINTAGE STEREO PREAMPLIFIER PREAMP SERVICED * NICE! This preamplifier has been carefully tested and is in excellent working order. All lights have been checked and replaced as needed. This preamplifier makes a very pleasing visual impression! Spec-1 Stereo Preamp. It use four GE 5751 tubes (12ax7). Included:AUDIO by VAN AUSTIN Transcendence Three Preamplifier. History:Single Loving Audiophile Owner / Non Smoker. Good - Minor Blemishes and Scratches. The highly versatile U-24 Program Selector from the golden age of Pioneer. Well engineered unit that preserves signal fidelity allowing you to create a stereo playground. Great for testing system synergy among many components. Very nice sounding Dynaco PAS-3. Very Clean. Includes a set of 12AX7 tubes. Please note: One of the switched power plugs in the back is cracked and sits loose. The “MPX FM” RCA plug seems to be missing the inner part. See photos. UNTESTED UNITS!! NO TUBES INSIDE. SUPER CLEAN. One is missing a few cover screws. Very clean inside and out. They have a white residue on the plastic knobs. It cleans off easily. NO RUST, OR CORROSION. One has plastic level shafts. One has metal shafts. SOLD AS IS. NO RETURNS. NO REFUNDS. Used MCINTOSH PREAMPLIFIER C 504 FACEPLATE GLASS C504 PREAMP Cabinet Vintage. Contacts have been recently cleaned works great no returns local pickup available from zip 33431 Specifications Frequency response: 20Hz to 20kHz Total harmonic distortion: 0.02% Gain: 61.1dB (MM), 20dB (line) Input sensitivity: 2.2mV (MM), 250mV (line) Signal to noise ratio: 90dB (MM), 100dB (line) Output: 250mV (line), 2.5V (Pre out) Semiconductors: 11 x IC, 14 x FET, 15 x transistors, 11 x silicon diodes Dimensions: 406 x 92 x 368mm Weight: 6.4kg Year: 1982 Shipped with USPS Priority Mail. You are looking at buying a used Sony STC-7000 Preamp. Item does work. Not sure if the am fm picks up stations. I have no antenna and can't even pick up the local station in this building im in even with a radio with a good antenna. Finally, you can update the look of your Carver C-1 pre-amp. The Laser printing gives you a high contrast, easy to read faceplate. THE FISHER 400-CX 2 Stereo Tube Preamplifier With Walnut Case Excellent Sound! The preamp has a beautiful holographic presentation and an inky black background. This masterpiece of a preamplifier has been professionally recapped and serviced by the lead tech at Tapehead electronics. Note, Unit does not screw into it's wood case, it can slide out if held face down or tipped forward. Here's anUntested Collectible Heathkit WA-P2 Audio Pre-amp. It is 12 1/4" long, 3 1/4" tall and 5 1/2" deep. Sold for parts. I Want YOU to be Satisfied. Velvet black background, wide dynamic range and very high S/N ratio. Only hand picked parts from known electronic parts suppliers are used in any of my repairs or upgrades. Bob Carver designed the C-1 preamp for the M500t amplifier. A circa 1955 George Gott tube mono preamplifier made by Bigg of Los Angeles California and resembles the McIntosh C8 pre amp. This pre amp uses two 12AX7's and has multiple turnover and roll-off settings for 78 rpm records and LP's manufactured before the RIAA standard. This preamp was built so well it looks like a factory wired unit. The graphics/lettering is 99% there. There are no missing screws on the back panel and no "scuff" marks on the front panel. All the Dynaco tubes test strong on my Sencore TC 142 tester. Powers on when plugged in. Onkyo P-3160 preamplifier only(Sorry, no accessories or manual). It is sold in as-is condition with no warranty. I agree to. Audio Research LS-7 tube line stage stereo preamp in silver with copy of manual! With photocopy of manual. If you appreciate the natural-sounding reproduction of music made possible by vacuum-tube technology, but were afraid of the hassles and the prohibitive pricehave we got news for you. For sale is a Bryston 1B Preamplifier. It works perfectly and has been professionally tested. Mono Tube Preamplifier. McIntosh C-8 Audio Compensator. Very nice unit. Ready for restoration. Made in Binghamton, NY in the 1950s. Beautiful unit. Here is a rarer then most UTC Model 4C Equalizer. This has not been powered up in years, maybe decades. I received this from a engineer of the local radio station in Youngstown Ohio. UTC Model 4C. A preamplifier, or preamp, is a part of the signal chain for using a loudspeaker to play audio. It adjusts the incoming signal from the source and prepares it to be boosted by a power amplifier. A preamp that uses tubes will have that classic warm, slightly distorted tone that appears in rock, blues, jazz, and many other genres. A preamp is necessary to transform a raw source from an input into something that can be played out of a loudspeaker. It alters and increases the power of the signal so that it can become audible. The preamp switches between different inputs and applies effects and equalization. In some models, it is combined into one unit with an amplifier, which is called an integrated amplifier. Generally, the quality of separate models is higher because each can specialize and make full use of its cabinet space. It is best to get a matched set from the same manufacturer to ensure that they will work well together. What do you use a preamp for? You can use a preamplifier for live play as well as recording. For live play, some instruments and microphones include their own pre-amp, but often you can purchase a separate one if you want a particular tone. For studio use, there are two main options. The preamp can come directly before a recorder to alter the tone if you want to record directly to a digital memory space. Otherwise, you can use sets of microphones on each instrument positioned right in front of its loudspeaker. This might be more desirable for a guitar, for example, to capture realistic reverb and to preserve a set of effects from a combination of power supply, preamp, power amp, equalizer, and pedals. What kinds of sound can a stereo preamplifier create? There are essentially no limits to the range and variation of expression from a tube preamplifier. Guitars especially will tend to have several pedals and other alterations to the tone before it reaches the amps, but the preamplifier still has a lot of influence on the audio. The pleasing harmonic distortion from the vacuum tubes forms an excellent baseline tone for just about any application, and the audio from the stereo can become more distorted or even overdriven without clipping. It has the capability to provide a clear and neutral audio tone, especially with well-informed use of equalizer settings as well as the right pedals and boxes.